I am taking a holiday break from teaching painting classes, but I can't wait to start again. My last class of beginners did some amazing work. Including learning to paint glass objects like the painting above! My next painting class begins on January 7th so there is time for you to awaken your creative spirit and join me. There is room for a few more! See below... and let me know you want to register! 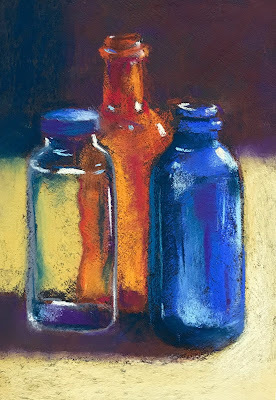 Playing with Pastels… Beginner and intermediate Join this class and experience a nurturing community atmosphere that will ignite artistic and personal growth whether you are a first time explorer or have had some experience. Students in this class will develop basic pastel painting techniques as we seek to discover our own style. We will explore color and composition, and refine our drawing skills.